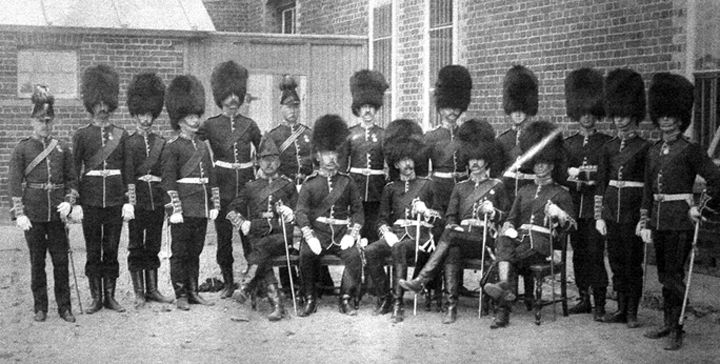 The Governor General’s Foot Guards were established by General Order 16 of 7 June, 1872. The GO was very specific in that “The Corps to be special and under the direct command of the Adjutant-General”. This unusual chain of command immediately set the GGFG aside from other Militia regiments of the day and set the tone that the GGFG were the nation’s regiment and not a City or Rural regiment. 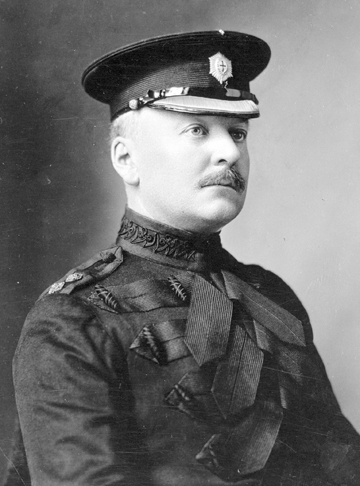 In fact, one of the prime reasons for the establishment of a Guards Regiment at Ottawa was to provide the Governor General, and to an extent Parliament, with the ceremony due his office. Officers, Warrant Officers and Sergeants of the Governor General’s Foot Guards, ca. 1873. Lt-Col Ross is shown seated, centre. As a Regiment of Foot Guards the GGFG adopted the uniform of their Allied Regiment, the Coldstream Guards. As such they adopted the red plume for the bearskin cap and wore their buttons in pairs. [i] For the better part of the next century, the GGFG looked to Britain for guidance in all matters pertaining to Dress and their headdress and cap badges readily testify to this. 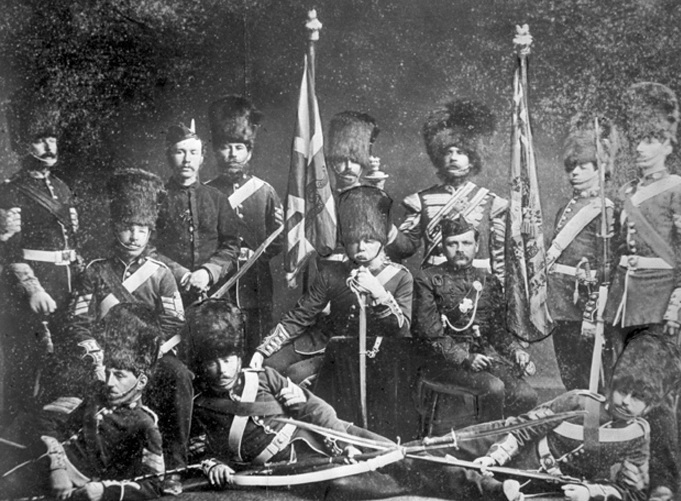 Officers of the Regiment, ca 1885. Note the three officers in cocked hats. These are the Medical Officer, Quartermaster and Paymaster who, as non-combatant officers, did not wear the bearskin cap. In addition to the bearskin cap, the GGFG wore the variety of headdress authorized by Dress Regulations of the time. 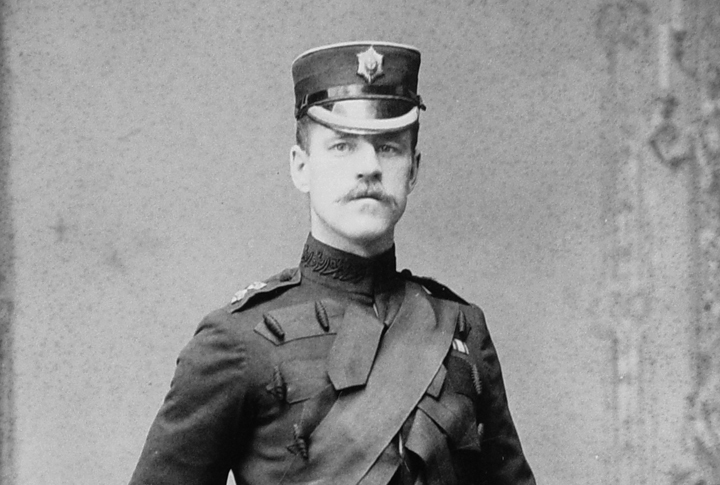 In the late 1800s these included the Field Service Cap (Torin pattern), the Forage cap and, for ‘non-combatant’ officers, a cocked hat in lieu of a bearskin. [ii] The use of the Torin cap was interesting as the authorized Field Service Cap for Infantry (from 1898) was the blue ‘Austrian pattern’ cap – similar to the FSC re-introduced in 1937 for wear with Battledress. Another cap was a fur ‘wedge’ style cap worn in Winter. 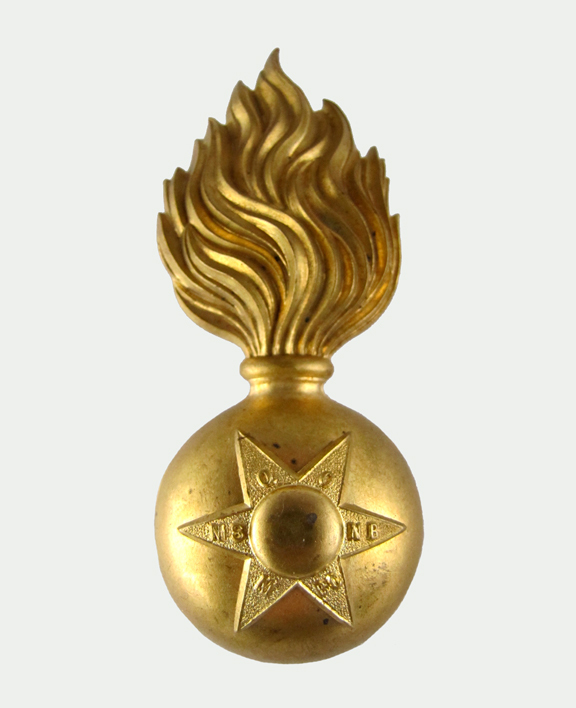 This cap featured an unusual badge (for the GGFG) in that it is based on a Fusiliers grenade. The early forage caps differed considerably by rank with officers wearing a dark blue cap with a black mohair band, an embroidered badge and a peak with 1/4-inch gold embroidery on the edge. Warrant Officers and Sergeants wore a similar cap but with a metal badge and a white band (Sergeants) or gold lace band (Warrant Officers), while Other Ranks wore a ‘pillbox’ cap with metal badge and white band. 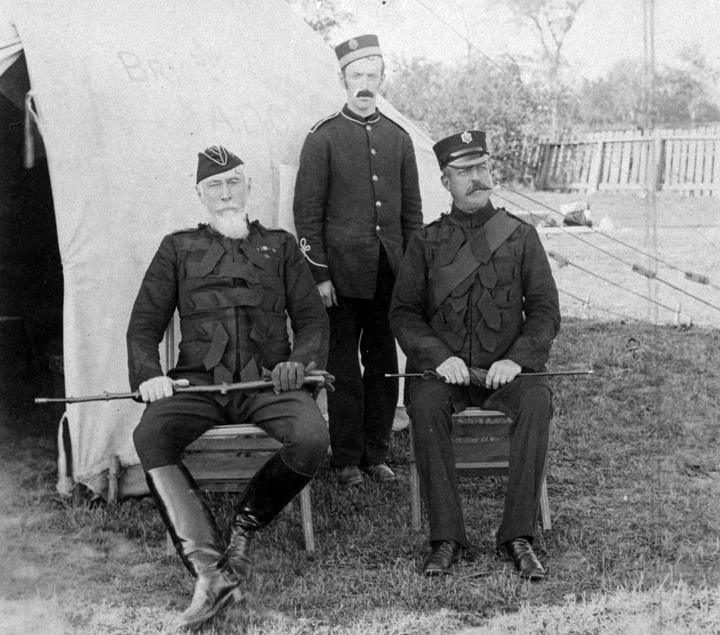 The Commanding Officer, Adjutant and an orderly, ca.1892. Note the Torin cap worn by the Colonel and the two styles of forage cap, bot OR and Officer, worn here. Of interest is the tunic worn by the orderly. Due to limited funds, Militia & Defence could not afford to purchase Guards pattern tunics and provided a quantity of Infantry patern tunics. Some of these were later adapted to double-buttons although the (incorrect) cuffs remained unaltered. MilArt photo archives. 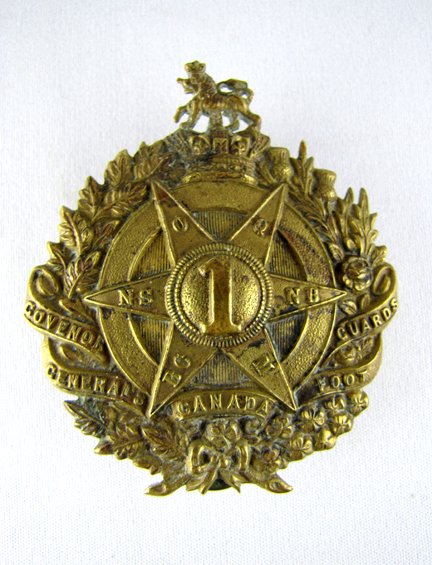 The badge design remained identical for all ranks – a six-pointed star, representing the six extant provinces of Canada in 1872 – although construction differed. The first description of the badges is to be found in the 1898 Queen’s Regulations and Orders which describe the officers’ badge as “A six-pointed star embroidered in silver 1 5/16 inch long by 1 3/8 inch wide. Oval medallion cross in centre of star, with a blue (St. George) cross in the oval”. A smaller, similar but metal badge is authorized for wear on the Torin cap. Other Ranks, who wore the plain Field Service Cap in lieu of the Torin, wore a larger badge as shown below. Perhaps the most interesting point to this badge is the misspelling of the word ‘Governor’. Early pattern forage cap. Unlike other infantry regiments were Field Officers display gold piping along the crown, all Guards officers wore this. The Officers’ forage cap evolved with the introduction of the Staff Pattern of forage cap and the crown became larger. Unlike other Regiments and Corps the GGFG retained a simple band of gold embroidery around the peak for all commissioned ranks, eschewing the Maple Leaf embroidery adopted by Field Officers elsewhere. An updated Forage Cap, more in keeping with the Staff, or Naval, Pattern introduced in 1904. While the Adjutant of the GGFG confirmed details with the Coldstream Guards it was discovered that the Officers’ cap badge was not in keeping with British Guards practice. Whereas the GGFG displayed the regimental name, in abbreviated form, in a circle around the St. George cross, every regiment of the British Brigade of Guards displayed the regimental motto. Once this was discovered the Commanding Officer of the GGFG wrote to HQ requesting permission to amend Regulations by removing the regimental name and replacing it with ‘Civitas et Princeps Cura Nostra’ – described in 1932 as representing ‘The state and the head of the State are our charge’. 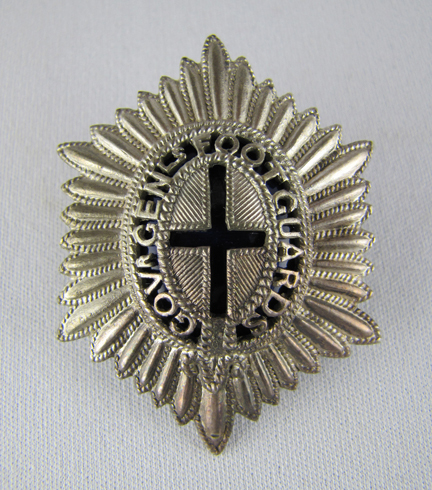 – The pre-war badge for Warrant Officer and Sergeants featured a pierced cross. 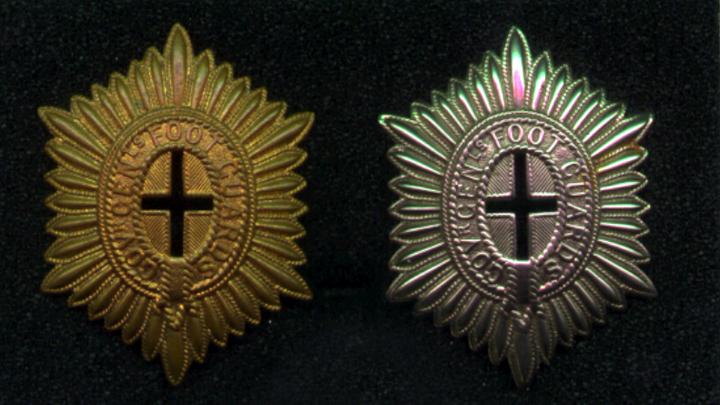 The brass badge appears to have been used prior to the First World Ward and into the 1920s when it was suplanted by the white metal badge. 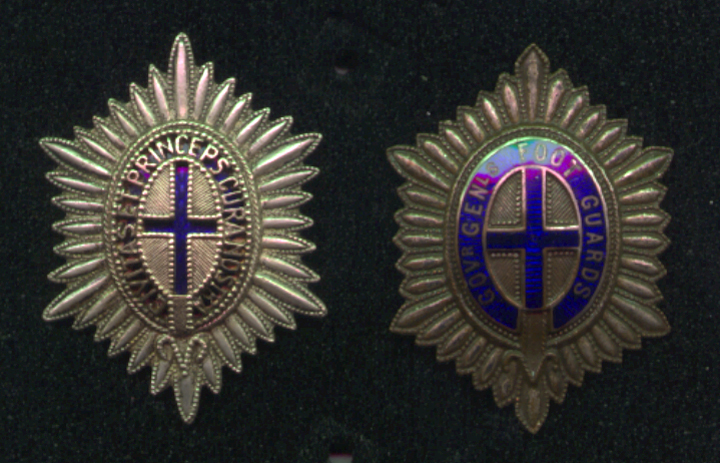 Pre-war only Sergents and Warrant Officers had a pierced cross although postwar all ranks wore the same badge. The Commanding Officer also suggested that, when new badges were made, that ‘a more effective badge could be obtained by the rays of the star between the points tapering very slightly inwards towards the centre of the badge.’ This design change was finally adopted, but not until well after the Second World War. Two GGFG officers. As Officers did not wear collar badges in Service Dress, and the GGFG had no authorized beret badge at this time, the officer on the left has taken a Senior NCO’s collar badge into use. In addition to cap badges the GGFG have a rich history of shoulder and collar badges as well as rank insignia. The author hopes to present a future article on these. [i] The number of buttons, within a group, identifies the seniority of (British) Brigade of Guards regiments with the Grenadier Guards wearing ‘single’ buttons, the Coldstream Guards’ buttons worn in pairs, the Scots Guards in groups of three, the Irish Guards in groups of four and the Welsh Guards in groups of five. The GGFG wear theirs in pairs In accordance with their alliance with the Coldstream Guards even though the GGFG are the senior regiment of Foot Guards in Canada. [ii] These officers were the Medical Officer, Quartermaster and Paymaster. The colour and shape of plume worn on the cocked hat differed for each of these officers. You can ‘rate’ this article by clicking on thestars (below). You van also leave comments by using the form at the bottom of this page. Very good article….just wished the author had put more informations about dress distinctions. There will be a follow-up article on the scarlet tunics of the Canadian Guards regiments coming shortly. Excellent summary of the badges worn by the Foot Guards. How about a post war sequel?